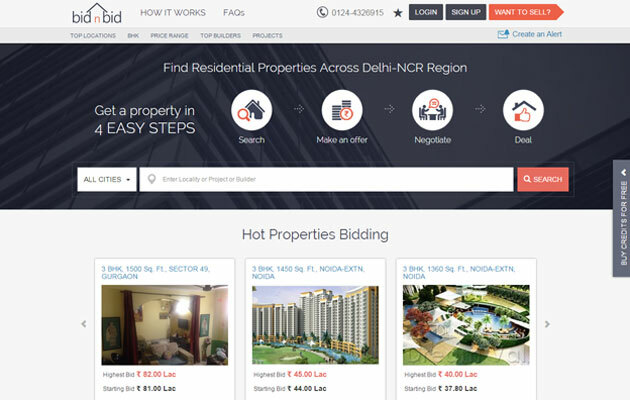 Media house HT Media Ltd's latest digital venture BidnBid comes across as a subscription-based online property auction site to help price discovery of residential dwellings in the country. In the process, it goes a step beyond a property listing and search venture, a segment which has several legacy and new age players, but stops well short of being an online property broker itself. BidnBid works as a real estate auction website that enables multiple buyers to bid for a property put up for sale by a seller, negotiate through the platform and then complete the transaction offline. The portal offers residential apartments and independent builder floors up for sale by individual owners as of now. It now plans to open its platform to property developers to list their new or unsold flats and apartments for sale directly to customers. "There are lots of players in the online real estate market today; however, none of them really addressed the real issue of the lack of transparency in price discovery for properties. There's always going to be this thinking of 'could my broker have reached out to two more buyers' in the minds of sellers. We aim to provide that level of comfort on price discovery to sellers and buyers with BidnBid," said Amit Garg, executive director - digital business at HT Media. HT Media is the publisher of The Hindustan Times and Mint newspapers and also runs a few digital businesses such as job portal Shine.com. Sellers can list their properties on BidnBid against a fee and set a reserve price for the property. The reserve price set by the seller is not shown to bidders and the initial bids are placed against a set starting price which is lower than the reserve price. Bidders, who can also decrease their bid amount during the auction, also need to pay a fee for participating in the auction. However, currently, as part of initial promotion both bidding and listing a property for sale is free. The auction is open to bids and counter-bids and based on the highest bid price (if it is above the reserve price) the deal is considered done. The buyer and seller can then meet offline and conclude the sale. The listed property will be featured for 60 days after which the seller can relist the property if the reserve price has not been met. BidnBid does a basic verification of the property documents, which can be uploaded by the seller, but advises bidders to independently verify before bidding. A refusal to seal a transaction which has otherwise successfully concluded in the auction would lead to refund of the fee by the other party. So, if the highest bidder refuses to complete the transaction, his/her fee would be accounted for while the seller will get his/her fee refunded and vice versa. BidnBid will also facilitate meeting between buyers and sellers as and when the bid is finalised in addition to scheduling visits to the property with a non-refundable 'visit charge' taken from the users' credit. If the auction process is over and the reserve price has not been met, the seller will be given two days to accept a bid lower than the reserve price or to reduce the reserve price. If the deal is not closed during these two days, credit of all buyers and sellers will be refunded. While the website helps users with price discovery, it would still need the help of a broker to complete the transaction. "This is a platform which customers can use with the help of a broker to get more confidence that the price they got is the best because the transaction process still requires a lot of hand-holding, where I think a broker would be required. We will also provide that service of connecting customers to brokers if need be, but we will not get into the transaction related processes because that belongs to the broking community. Our business would be more in terms of charging the subscription fee," Garg said. BidnBid claims it has more than 250 sellers listing their property on the website and Garg says three transactions are completed already. The venture is currently focusing primarily in the Delhi-NCR region, the largest residential property market in the country by volume. "We have listing from other parts of the country, but a large part of our listing comes from Delhi-NCR because that's where we have done our promotions. We will expand to other cities as well. We are not stopping any bids coming from any markets, but we haven't decided which market to go next," said Garg. BidnBid plans to leverage HT Media's multiple media properties to build its customer base. Although it doesn't compete directly with various online property listing or brokerage ventures such as MagicBricks, 99acres, CommonFloor, PropTiger, IndiaProperty and Housing, it joins as a new product in what has become a fairly competitive space. It also becomes another media house to get into this business. HT Media's arch rival in the newspaper business Times Group owns MagicBricks while PropTiger is part owned by global news and digital property firm News Corp. News Corp also owns the parent of this news website.